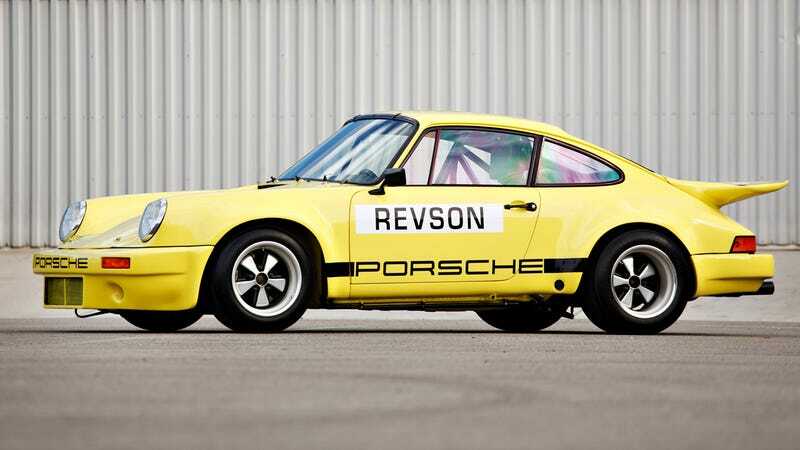 By now the world knows about the three rare Porsches Jerry Seinfeld put up for sale, but the reality is that tomorrow, you can actually buy pretty much the entire Jerry Seinfeld Collection at Gooding & Company’s East Coast auction. Here are all his special cars up for grabs. But before we have a look at what will buy Jerry at least three very pleasant private islands somewhere sunny, let’s have a peek at some other lots, because I know of at least nine more stunning reasons why you should max out your checkbook at Gooding’s Amelia Island Auction. For starters, here’s a 1973 Fiat 130 Coupe. Buy one before one of us does. Have you ever heard on Muntz Roadsters? Here’s the very last of the 198 built from 1953. One of the nicest Alfa Romeo Montreals in existence? Yes, please. I also like woodies, but is a 1940 Buick Super Estate Wagon really worth $325,000? Holy cow! Need another five? Let’s start with a budget car: a 1976 Triumph TR6. These roadsters are just badass. If you don’t fancy Jerry’s Beetle, how about a perfect early one from 1951? Buy it before Torchinsky does. Here’s a tasty Series III Lamborghini Espada for the family men out there, a 1966 Abarth 1300 OT Periscopio if you wanna go loco, and last but not least, an Iso Grifo if you think an Italian muscle car is the ticket. One of just two Carrera GT prototypes, purchased directly from Porsche by Seinfeld in 2007. It was driven by Walter Röhrl back in the day for Porsche’s photo shoots, but you can’t drive it today. Not only that, but any future sale is subject to a right of first refusal in favor of Porsche. Works 962C Run by Joest Racing with Porsche Factory Support. Campaigned in 1990 FIA World Sports-Prototype and 1991 Interserie Championships. Two owners from new: Joest Racing and Jerry Seinfeld. Restored to as-new condition and fitted with the Singer-developed Doppelflügel wing. Built for Seinfeld with Porsche Exclusive Customization Packages DZM and DZP and finished in Pure Blue, this is 009 of the 356 997 Speedsters produced and one of just 100 imported for the US market. Jerry: “Porsche made this car just for me with a lot of cool bare carbon fiber, which I never get tired of”. Estimate: $300,000 - $400,000. That 4.0 flat six designed by Hans Mezger, that historic livery, that wing. This is it. One of five, purchased new by Jerry Seinfeld from Brumos Porsche. Two hours of track use in all at a private track day at Willows Spring Raceway. Estimate: $300,000 - $500,000. The final evolution of the air-cooled Euro-spec M64/75 engine, one of just 45 built. Never raced, less than 3,700 miles from new. One of approximately 56 GS/GT Carrera Speedsters built with alloy panels, believed to be only one finished in Auratium Green. Equipped with the rare Type 692/0 Four-Cam Engine. Acquired by Jerry Seinfeld in late 2012. One of only 76 examples of the Porsche Exclusive-built 964 Turbo 3.6 S Flachbau. Equipped with the high-performance X88 engine. One of 39 US-spec cars built, and the only one finished in Polar Silver Metallic. One of only 71 Jagdwagens built and as few as 15 extant. Four-wheel drive and amphibious capability, 1,582 CC OHV Type 616/6 flat 4-cylinder engine, all the fun. A real beauty made just before the 911 was getting ready. “I’ve had this car for 15 years and driven it everywhere. It’s a dream car for me. First IROC made and first 3.0 911 ever. Only Porsche made indestructible, full-on race cars like this that you could, and still can, drive anywhere you want. The sound will make your life.” Estimate: $1,200,000 - $1,500,000. A four-cylinder twin-cam, an aluminum body, no crash protection. Porsche going back to basics in the fifties. For 1,168lbs of pure joy, you only need to fork out an estimated $3,800,000 - $4,200,000. A white Speedster from the ‘80s with less than 3,800 miles on the clock. Jerry: “One of my favorite 911s and another of the greatest summer cars of all time. I like the Star Wars Storm Trooper look with a snazzy low-cut top. I’ve had five different ’89 Speedsters over the years in different colors. Loved every one. This one is cool because it doesn’t have A/C. Lighter.” It’s almost cheap too, estimated to fetch between $250,000 - $325,000. “My favorite detail is the Porsche badge on the nose, which has been left in it’s original condition. Note the fit of the rear lid and the shift pattern sticker on the windshield. So perfect. ‘57 was the only year for Aquamarine Blue Metallic, and the beehive tail lights are the best.” Estimate: $500,000 - $600,000. It’s lighter than the one above. 15,500 miles from new, totally original and unrestored. “I love the colors of this car and the mileage is ridiculous. This is the last year of the classic 36 hp engine. I think selling this was a huge mistake.” Estimate: $35,000 - $55,000. “When my kids were little we would drive around in this bus every Sunday to get bagels and lox. The little kitchen drives them wild. We got busted by the cops with it for putting up an illegal lemonade stand this past summer in the Hamptons.” Estimate: $80,000 - $100,000. Grand total based on max estimates: $32,555,000. Sorry Jerry, you still can’t buy a Ferrari 250 GTO, but grabbing two McLaren F1s wouldn’t be a bad idea in case you already have an island. Photo credit: Gooding and Co.
Are Employee Pricing Sales Really a Good Deal? Does A Dealer Have To Honor An Online Price Quote?